Tony, your Aunt recently passed away and she left a bequest so that we may play The Mozart Requiem in her memory, can you tell me a little about her? My aunt, Eva Bunzl was born in 1932 into a wealthy family in Vienna with a Catholic mother and Jewish father. She remembers attending the Vienna State Opera and every Sunday went to mass at St Stevens Cathedral in the centre of Vienna which is where she would have first heard a performance of the Mozart Requiem. After the arrival of the Nazi government in Austria her father, brother and sister moved to England, leaving Eva with her mother to live out the war in Salzburg, fearful of her Jewish heritage being discovered and suffering severe hardship not least because of her mother's alcoholism. After the war she spent much of her adult life in Milan before moving to England in the 1980’s. She spent many years in supported accommodation and her last years in a nursing home in Wimbledon. What was her life experience of music? Did she sing or play an instrument, and tell us about her love of Mozart and the Requiem? She led a lonely life and even though she was never given the opportunity to play an instrument, music was one of her few comforts. Eva always enjoyed attending the WSO concerts and left a bequest to the orchestra in her will. She specially asked if the orchestra would play the Mozart requiem which was one of her favourite pieces. The orchestra rarely performs choral music so it is a special treat for the WSO to join forces with Sonoro and the Wimbledon Community Chorus to play the beautiful music marred only by the lack of flutes in its instrumentation. I am delighted to introduce Wimbledon Symphony Orchestra’s 2018-19 season and what better way to open it than with Gaspard the Fox, the handsomest fox in London! We’re thrilled that the author and BBC Radio 4 broadcaster Zeb Soanes is returning to WSO for the third time to read extracts from his recent book and he will be signing copies after each Foxtrot concert (Saturday 13 October 2.00pm and 4.00pm). The programme opens with Rossini’s The Thieving Magpie and ends with Poulenc’s Baba the Elephant so be prepared for an adventure! The celebrated violinist Jennifer Pike also makes a welcome return to WSO on Saturday 08 December to perform Korngold’s stunning violin concerto filled with lyrical melodies and virtuosic writing for the soloist. Korngold gained an iconic reputation as a Hollywood film composer and you may hear references to some of the film scores he incorporates in the work. With Mahler and Beethoven in the programme too, this is a concert not to be missed. WSO has been supporting Macmillan Merton for over twenty years and our annual concert at St Paul’s Church SW19 6DA is always a special occasion for both organisations. As well as the popular programme we are always treated to the most delicious refreshments made by the Macmillan committee, all in aid of this vital charity. On Saturday 02 March 2019 we shall feature WSO’s talented principal clarinet Richard Stockall in a performance of Finzi’s clarinet concerto and Brahms Symphony no.1, not forgetting Suppé Light Cavalry Overture which will take you back to those Disney Mickey Mouse cartoons! And now to two new collaborations: firstly we are delighted to be partnering with Wimbledon Community Chorus and the professional choir Sonoro in a performance of Mozart Requiem on Saturday 30 March 2019. This is an exciting opportunity for WSO to meet and perform with local amateur singers and professional singers, some of whom will also be performing Mozart Exultate Jubilate and other well-known masterpieces in the first half of the concert. Our final concert of the season is another new venture, an Opera Gala on Saturday 22 June 2019 featuring talented young professional singers from National Opera Studio, a prestigious training organisation based in Wandsworth. They will perform famous solo arias and duets by Puccini, Verdi and Wagner, many of which are likely to be familiar to audiences including ‘Vissi d'arte’ and 'E lucevan le stelle' from Puccini’s Tosca. This is perfect entertainment for a summer’s evening, and you never know, there might even be a glass of Pimms! WSO is grateful to our regular professional conductors Andrew Morley and Leo Geyer, who help us to bring these imaginative concert programmes to fruition, to the Friends of WSO and Humphrey Richardson Taylor Trust who support us, and to the WSO committee who work with great commitment throughout the season. We are looking forward to our next Family Concerts on Saturday October 13th when we will be bringing you on a merry musical adventure with our line up of a thieving magpie, a cunning fox and a little elephant ! Our local hero, Gaspard the Fox, is an urban fox brought to life in a new children’s book written by author Zeb Soanes. You may remember Zeb, who narrated our last family concert ‘The Christmas Carol’! Zeb’s official website www.gaspardthefox.com gives more background of Gaspard with some enlightening interviews with Zeb about how this fox came to life, where his name came from, and importantly where you can buy the book! Our super creative composer conductor Leo Geyer has teamed up once again with Zeb to imagine the musical colours that will enhance not only the adventures of Gaspard, but also Baba the elephant and of course not forgetting that thieving magpie! Leo immediately made the connection to Beethoven’s 6th Symphony, the Pastoral symphony, when he first read Zeb’s book. He found imagery linking the two compositions. For example in Movt. 2 – ‘Zene am Bach’ –( Scene by the brook) - this represents Gaspard by the canal. Another example, is found in Movt. 3 –‘Lustiges Zusammensein der Landleute’ (- Merry gathering of country folk) – the melody played by the brass section representing heavy folk music is a perfect pairing for the scene where Gaspard meets the squeeze-box player! Come along on Sat 13th at either 2pm or 4pm when Zeb will join Leo and the orchestra for our lyrical Adventure of the Animals! We're excited to be welcoming back guest conductor Leo Geyer for our summer concert in June featuring Harpist Olivia Jageurs. Here Leo shares a little more about the programme for this concert which we know will be a wonderful evening - "This programme is an exploration of orchestral colour, showcasing the 20th century masters of orchestration. Opening with two neo-classical dances originally written for piano, and beautifully orchestrated in both cases by Ravel. Continuing with the dance theme, Debussy’s harp concerto will be performed by the award-winning young virtuoso Olivia Jageurs www.olivia-harpist.com . The first half will conclude with Ravel’s explosive La Valse which many argue sets out to destroy the Viennese Waltz. Rimsky-Korsakov’s symphonic poem Scheherazade comprises the second half of the concert and tells the middle-Eastern folk tale One Thousand and One Nights. This love story is told through transformations of leitmotifs and dazzling orchestral colour." The trick to turning butterflies into a box of miraculous delights, Zeb Soanes in conversation with WSO's Helena Todd. This year Wimbledon Symphony Orchestra is very excited to be sharing the platform with BBC Radio and Television broadcaster Zeb Soanes. Zeb will narrate Peter and the Wolf and Little Red Riding Hood in our family concert on 20th November, which features as part of Wimbledon International Music Festival 2016. WSO’s Helena Todd took the opportunity to pose a few questions to Zeb to help us know a little more about the man behind the soothing tones that many recognise as the voice of the shipping forecast. What are you most looking forward to about this concert? Peter and the Wolf is a piece I have wanted to perform for years. I first heard it in my Primary school. I had a wonderful music teacher called Mr. Taylor who illustrated pieces of music on an overhead projector, then played the record and we would copy the pictures into our books - even now when I hear those pieces of music I can visualise his illustrations. There are so many characters in Little Red Riding Hood and Peter and the Wolf. How did you devise their voices? Mostly the voices that I hear in my head when I first read something are the ones I choose, it’s instinctual, then when you try them out loud you discover how easy they are to sustain, whether they are clear enough in a live performance. You try to make them as distinct as possible and fully rounded characters. How do you then practice these voices into familiarity? I don’t think about it, it’s just like singing - you think of the note and then you sing it. I think of the character and my body does what it needs to do to make the right sounds. I’ve played with my voice and made silly voices since I was a child; we had a cassette recorder with a microphone and I would pretend to be Terry Wogan or Russell Harty interviewing my sister as Margaret Thatcher. Besides news shows, you have presented a number of music shows including The Proms and Songs of Praise. You are also a patron for Awards for Young Musicians. Where does this musical involvement come from? From my family. My sisters and I were encouraged to play the piano, my mother was in a choir and dad played the church organ. I used to come home from school and spend hours improvising on the piano. AYM is a wonderful charity, funding talented young musicians who otherwise couldn’t afford to buy an instrument or take lessons. 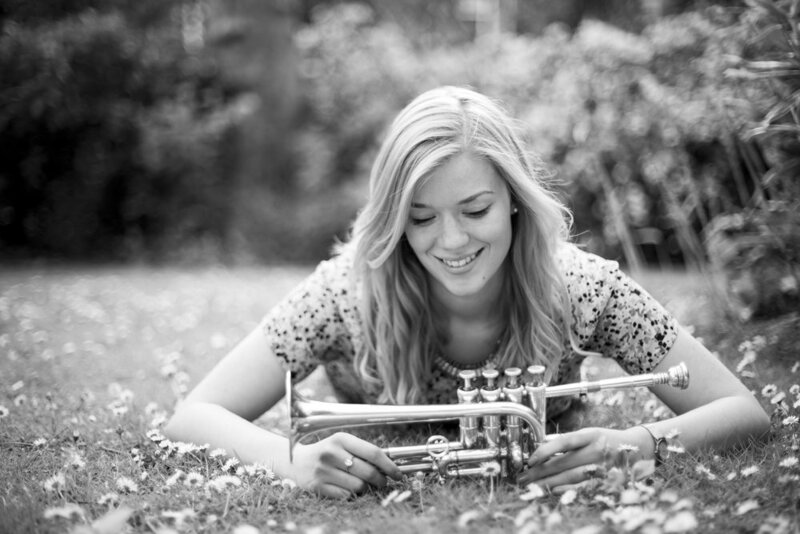 Two BBC young musical winners have been supported throughout their studies by the charity. Your voice is a real tell tale of how you are feeling emotionally. How did you train out quivers, shakes, audible smiles? A studio microphone is a very sensitive lie detector, you can’t fake ‘fun’ or ‘sympathy’ and it makes me cringe when I hear it. That means it can be tough when you’re reading the news at 5.30am and wishing you were still in bed. Everyone feels nerves sometimes, particularly when things go wrong or you’re covering a major event that you know millions are tuning in for. You develop a kit bag of psychological tricks to deal with these things and my way of handling nerves is to tell myself the butterflies are actually excitement and a willingness to get on with whatever it is I’m about to do. And an audible smile is a wonderful thing, when you want to show it: it can subtly suggest incredulity or elicit forgiveness if you’ve said something you shouldn’t. If you could spend a month in another job of your choice, what would it be? Were there early signs of you being a news reader? How were you spotted? I was a very shy child but it didn’t stop me wanting to be a performer so long as I was being other people. I used to invent puppet shows and do all the voices, I wrote plays in my primary school and had a very inspirational drama teacher at High School, who was rewarded with a thank you in last year’s BAFTAs by another former student. At university I was in an improvised comedy show and was spotted by the BBC because I was a good mimic until one day needed me to read the news (which was terrifying). My career-plan was to be an actor playing anyone other than myself and have ironically spent the last 20 years mostly using my own voice. What from your childhood do you associate with Christmas? One of the most magical children’s television programmesIsaw as a child was The Box of Delights (BBC, 1984) which had Hely-Hutchinson’s Carol Symphony as its theme. Whenever I hear that piece of music it feels like Christmas and I am 9 years old. It has made me love The First Nowell for the same reason. Is there something in particular you would love to narrate or a show you would like to appear on? I would love to narrate Britten’s setting of W.H. Auden’s poem Night Mail to accompany a screening of the GPO film for which it was composed and I would quite like to live in the BBC’s Cranford (only with better medical facilities). Wimbledon Symphony Orchestra will be welcoming families and children of all ages to our "Christmas Adventures" concert on Saturday December 5th at 3.00pm at Holy Trinity Church on Wimbledon Broadway, which is within walking distance of the heart of Wimbledon town centre. The concert will be directed and narrated by award-winning composer and conductor Leo Geyer, and will be a perfect way for children to hear a live symphony orchestra perhaps for the very first time, and for families to enjoy a festive musical tale featuring a programme of well-known music. We hope you will be able to join WSO for a Christmas adventure like no other. Opening with joyous dances from the Nutcracker and sing-a-long carols, Christmas receives an unexpected guest – The Mountain King. After explosive dances from the Firebird, Santa returns in his Sleigh for Christmas merriment. Our November concert will be a celebration of the life of broadcaster and friend of WSO, Paul Vaughan and will feature the beautiful and well known clarinet concerto by Mozart. Paul Vaughan was a long-standing member and supporter of WSO. He was a celebrated broadcaster of science and arts programmes, a journalist, author and narrator and presented the Radio 4 arts programme Kaleidoscope from 1973 to 1998. Paul joined WSO in the 1960s and remained a loyal and regular player until 2010 as a member of the clarinet section as well as serving on the orchestra’s committee and writing concert programme notes. He was a passionate chamber musician and was fond of organising informal sessions at his home. The repertoire for this concert has been selected with Paul very much in our minds and features the clarinet as a solo, chamber and orchestral instrument. We are excited to be announcing our Concert Schedule for the 2015-2016 season, which will see WSO performing four concerts. Our November concert will be a celebration of the life of broadcaster and friend of WSO, Paul Vaughan and will feature the beautiful and well known clarinet concerto by Mozart. In December by popular request, we will be putting on an afternoon Family concert - further details to be confirmed shortly. This season our regular 'Macmillan' concert in aid of Macmillan Cancer Support will be in March featuring the monumental Sibelius Violin Concerto, and the season will close with our summer concert in June, with an exciting and diverse programme to get everyone in the mood for the start of the tennis! We are very happy to be welcoming back Andrew Morley as guest conductor for our November and March concerts, and we are also looking forward to performing with two new guest conductors, Leo Geyer and Dominic Alldis for our Family and Summer concerts. We are also thrilled to have secured the talents of a number of star soloists this season - Clarinettist, Joseph Shiner, and tenor, Neil Latchman as well as Joo Yeon Sir who regular WSO concert attendees may remember following her amazing performance of the Beethoven Violin Concerto with us in January 2015, and her generous and hugely enjoyable performance of the Brahms Violin Concerto at our 'Brahmsathon' event in May. Further details for the programme for our December Family concert will be announced shortly and tickets for the November concert will also be on sale shortly - Please keep an eye on the site for details and links. We are looking forward to an exciting and varied season and hope that you will be able to come along to hear some of the great programmes and artists that we have in store. Our recent 'Brahmsathon' was a great success - A fun day of music making and fundraising for WSO. Under the direction of guest conductor Andrew Morley, the orchestra together with a number of visiting players, played all four Brahms symphonies, the Violin Concerto and we just managed to squeeze in one Huungarian Dance at the end of the day. We were pleased to welcome a number of guest conductors throughout the day and we would like to thank everyone for their time and support. For more on the Brahmsathon and to find out how you can donate to WSO as part of "Brahmsathon" please follow this link - Brahmsathon Info. On Saturday March 14th Martin performed what may already be becoming his signature work, Rachmaniniov's Rhapsody on a Theme of Paganini with the Kensington Symphony Orchestra at St John's Smith Square in London. To read the full review of this concert by Colin Anderson on Classical Source go here. We are excited to welcome as guest conductor Andrew Morley for our forthcoming Spring Concert who will direct the orchestra performing a programme including Debussy, Rachmaninov and Tchaikovsky with the winner of BBC Young Musician 2014, Martin James Bartlett. Andrew has held teaching posts at Lancaster University, Junior Trinity and Oxford Brookes University and is conductor of the Junior Trinity Symphony Orchestra, St. Paul’s Sinfonia, the BBC Elstree Concert Band and Southampton University Sinfonietta. In February 2004 he was awarded first prize at the prestigious Allianz-Cornhill Musical Insurance Conducting Competition having received unanimous votes from both jury and orchestra. After ten years, Robin Browning has stepped down as Music Director of Wimbledon Symphony Orchestra. We would like to thank Robin for his commitment and creative vision, which has seen WSO perform many successful concerts including two all-Beethoven programmes, first in 2008 at Cadogan Hall with renowned pianist Charles Owen performing the Emperor Concerto, and his final concert with WSO in Jan 2015 performing Beethoven Violin Concerto with award winning violinist, Joo Yeon Sir. In November 2014, Robin conducted our much acclaimed World War I “In Memoriam” featuring the music of Vaughan Williams, Butterworth and Shostakovich. We wish Robin all the best with his future career.